The splendour of Indo-Persian design that transcends the mundane to transform the world into a palace. The Coronation of Emperor Mohammad Reza Pahlavi and Empress Farah Pahlavi of Iran was held in the Grand Hall of the Golestan Palace of Tehran in 1967. The Emperor crowned his consort, Farah Pahlavi, during his own coronation ceremony. This was the first ever crowning of a wife of an Iraninan monarch and was a symbol of the modernisation of Iran. It was to be the final monarchy of Iran as it was overthrown in the Iranian Revolution of 1979. The Empress’s coronation robes were designed by Marc Bohan of Christian Dior and the attire was woven and cut in Iran. The green velvet robe featured the House of Pahlavi coat of arms embroidered in gold and adorned with diamonds, rubies and emeralds. The train of the robe was five metres in length. The coronation jewellery of crown and necklace was made for Empress Farah in Iran by Parisian jewellers, Van Cleef & Arpels, from items in the Iranian Crown Jewels. I braved the hordes of tourists and the maze of the British Museum to stand before this crown that is simply breathtaking in its simplicity and beauty. The crown is handcrafted from dainty pieces of hammered gold to form a framework of a horizontal headband with vertical inserts and all adorned with hand made gold flowers and wired droplets. The gold is reflective and the droplets create a constant shimmering movement. The crown is designed to be dismantled in to half a dozen pieces and reassembled with ease as befits the nomadic lifestyle. 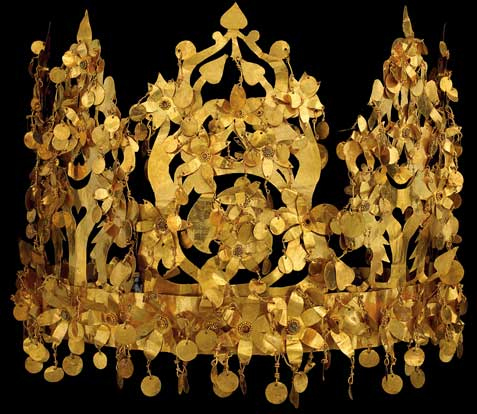 In 1978, on the eve of the Soviet invasion of Afghanistan, at the heritage site of Tillya Tepe, a nomad cemetery, a Russian archaeologist discovered over 20,000 pieces of jewellery, including this exquisite gold crown. During the ravages of war, these precious artefacts were hidden by Afghan officials, but now these treasures are free to travel the world to remind us of the rich cultural history of Afghanistan.